I’m the author of three Thermomix cookbooks and numerous eBooks. In the Mix: Great Thermomix Recipes and In the Mix 2: More Great Thermomix Recipes feature recipes from great chefs around the world, as well as my own family favourites. My Entertaining book and recipe chip features 13 glorious menus to make entertaining at home easy and joyful. With all my books, my aim is to encourage and inspire home cooks with recipes that are full of flavour, present beautifully and spark joy around the dining table. I love to include special tips, twists and techniques that upskill, equip and leave readers confident to embark on more culinary adventures. The aim of this book is simple but exciting: it’s to make it easy, fun, satisfying and – of course! – delicious to entertain at home. The book is packed full of delicious recipes packaged into themed menus, allowing all cooks to gracefully create stunning dinner parties, celebrations and occasions. I also love sharing recipes, tips and inspiration at my fun, tasty cooking classes. Find out what’s coming up. See my Entertaining tips for music playlists, wine matches and extra tidbits for every chapter of the book. Dishes from my first book include George Calombaris’ Pumpkin Soup with Virtual Bacon Dust, an extraordinary Kirsch Ganache from James “Jocky” Petrie (previously at The Fat Duck) and Cath Claringbold’s delicious Chicken Tagine with Harissa and Cous Cous. The book also includes my all-time favourite Spaghetti Bolognese and a Beef Stir-Fry that has revolutionised meat cooking in the Thermomix for thousands of people. My second book includes many of my favourite contributors from the first book, as well as an amazing array of world-famous new chefs including Spain’s Elena Arzak, Italy’s Massimo Bottura and Germany’s Nils Henkel. A dish from the UK’s Gary Foulkes stars on the cover: it’s a stunning Cauliflower and Blue Cheese Bavarois with Pickled Radish Jelly – everyone who makes it loves it! Top chefs Ben Shewry, Mark Best, Peter Gilmore and Darren Purchese are among the Australian chefs who have shared recipes. I’ve tested and, when necessary, adapted every dish for home cooks. In 2007, I was researching a story about chefs and the gadget they wanted next. This word ‘Thermomix’ kept coming up…I had to see what it was all about and before too long I had one on my kitchen bench. But where were the great recipes? My hunger for great Thermomix recipes and my love of beautiful cookbooks spurred me to create. In all three books, photography is by Greg Elms and styling is by Caroline Velik and Fiona Rigg. 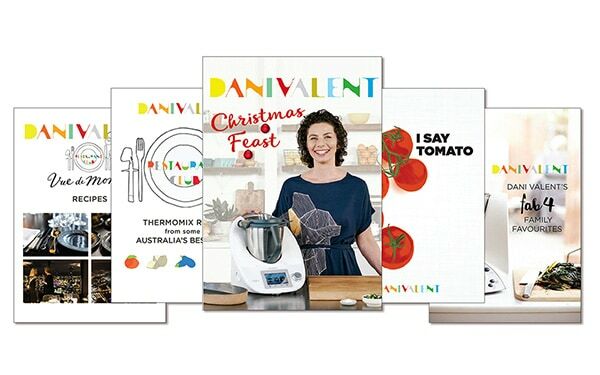 Slattery Media published the In the Mix books and Thermomix in Australia is the publisher of Entertaining with Dani Valent.